In the wake of the Pinball Cafe's closure, a look at how we got to Toronto's current pinball rules. 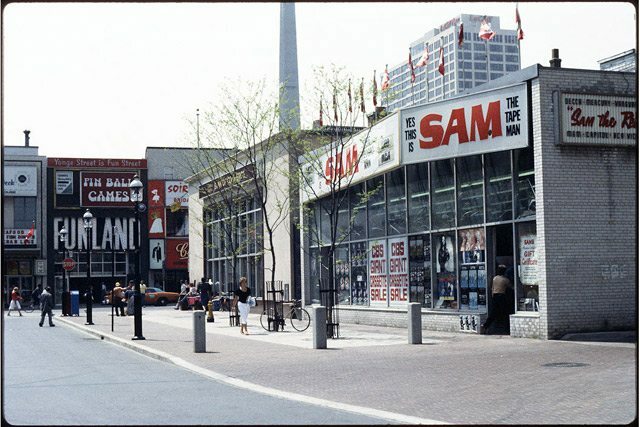 Funland, Yonge and Gould Streets, circa 1980. City of Toronto Archives, Fonds 200, Series 1465, File 19, Item 26. The issue of permitting pinball, mechanical and electronic game machines in the City of Toronto has been the subject of debate, by-laws, an Ontario Municipal Board hearing and Council sub-committee attention over the past 13 years. To date, no mutually satisfactory agreement on an appropriate policy has ever been reached between industry representatives, the City of Toronto, and the Toronto Board of Education. Guardians of public morality had long battled the evils of pinball. During the 1930s, the main concern was gambling, as some machines issued slugs used for monetary rewards instead of free games or candy. Starting in April 1937, Toronto police frequently raided businesses with pinball machines, charging owners with keeping common gaming houses if any funny business was going on. The legal status of pinball varied between municipalities, ranging from a total ban (Forest Hill, 1944), to legally imposed restrictions on operating hours (New Toronto, 1949). By the late 1950s, a logic-twisting Supreme Court of Canada decision on games of chance wound up classifying pinball machines as illegal gambling devices. This didn’t stop operators from finding loopholes, nor did it stop people buying machines for home use. The battle over pinball heated up in January 1975, when the Metro Toronto Police morality squad shut down 150 machines at Peter Budd’s four arcades on the Yonge Street Strip, including his flagship Funland parlour. Budd was told he wouldn’t be charged with keeping a gaming house as long as the machines stayed unplugged. 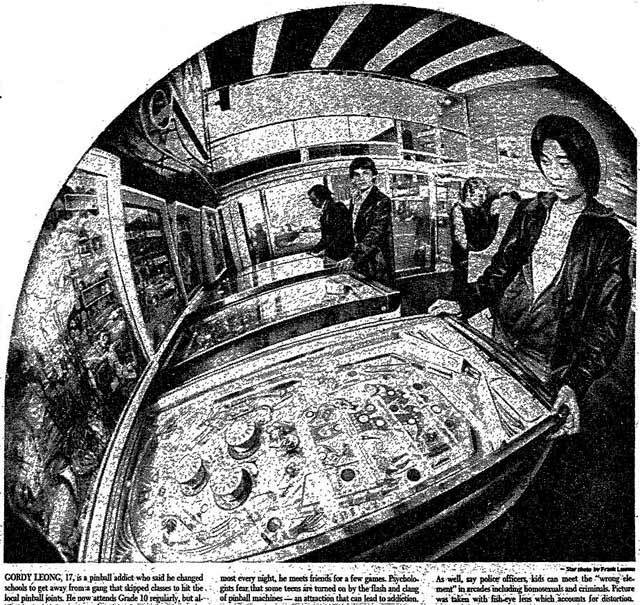 A Star editorial published two weeks later declared the pinball laws “silly” and the effort to police them a “waste of time.” Federal Minister of Justice Otto Lang soon introduced amendments to the Criminal Code legalizing pinball machines, which came into effect in January 1976. 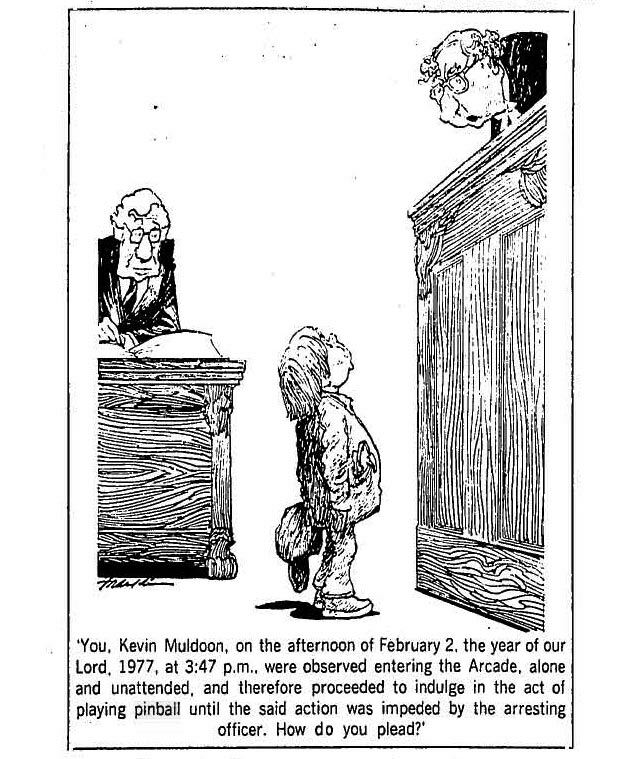 Cartoon, the Globe and Mail, February 10, 1977. After a failed attempt to wrest stronger regulatory powers from the province, the City tinkered with its general zoning by-law to restrict where games could be located. An amendment added in December 1979 prevented pinball “establishments” (defined as any business that offered between three and 20 pinball or video games) from locating within 300 metres of any school. Establishments could not be within 150 metres of one another. Other commercial businesses were not allowed to install machines unless they were located in specific industrial-zoned areas, which turned out to be the Port Lands and the Stockyards. Already-existing businesses like Funland were allowed to continue operating, which probably displeased those crusading to clean up Yonge Street. The City had trouble enforcing the by-law, so officials decided to loosen it up. New regulations, passed by city council in 1984, reduced the school-proximity rule from 300 to 45 metres. Up to 10 pinball or video games were allowed at certain types of entertainment establishments, ranging from bowling alleys to movie theatres. Other businesses would be allowed to install up to two machines. Source: the Toronto Star, April 11, 1978. The headline on this story was "Pinball's clang, flash, lure Metro teens to sleazy life." The city’s public and separate school boards were not amused. Officials dug out stacks of studies citing the harmful effects of pinball. They took their concerns about delinquency, drug abuse, loitering, lost lunch money, and vandalism to the Ontario Municipal Board. The OMB struck down the new by-laws in October 1985, claiming that they “lacked any valid planning principles.” With plenty of recently purchased pinball machines across the city suddenly made illegal, the City decided not to pursue any owners until yet another set of regulations could be adopted. After close consultation with educational officials, the City’s Land Use Committee issued a report in 1987 that recommended keeping many of the machine ownership limits established in 1984 (except for entertainment venues, who would be limited to five machines instead of 10) but with the old school-distance limits. The report also recommended that anyone under the age of 18 not be permitted in pinball establishments between 8:30 a.m. and 4 p.m. on school days. These restrictions led to an outcry from the amusement industry, resulting in years of discussion. The outcome was the current set of rules—the ones the Pinball Cafe failed to follow. Additional material from the January 30, 1975, September 27, 1976, and February 9, 1977 editions of the Globe and Mail, and the April 12, 1937, February 11, 1975. March 2, 1977, and October 10, 1985 editions of the Toronto Star.